Most progress at school is accomplished visually. Despite the well-known link between vision and learning, a lot of parents underestimate or are simply uninformed about vision problems, and don't get their child's eyes checked frequently enough. 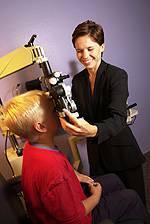 As your child's vision may change frequently, regular eye and vision care is necessary for success at school. It is especially important to keep an eye out for the signs and symptoms of vision problems as your child progresses in school. Telltale signs may include confusing numbers or letters, watery eyes and frequent eye rubbing, squinting, avoiding small print, and head tilting. Struggling to meet the demands schoolwork can make on a student's eyes may potentially change his/her performance. Technology that's recently been integrated into the classroom, such as the use of interactive whiteboards, can also potentially heighten previously unknown vision problems. When a student doesn't have good enough vision, it isn't just their school work that suffers. It's mentally and emotionally taxing too. If you're the parent of a glasses-wearing child, the start of the school year is a good opportunity to consider getting a new pair of frames. If you want a student to wear his glasses, he better be comfortable in them! So don't forget to make an appointment to see us when you're gearing up for the new academic year. We'll do our very best to help your child begin the new school year with excellent vision.